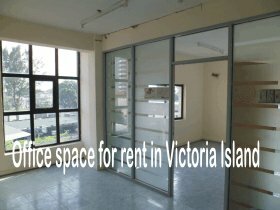 We have the following office space for rent in Victoria Island Lagos Nigeria. 1. 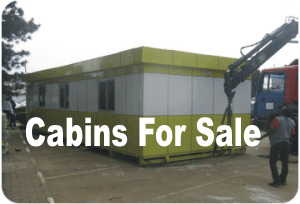 180 square metre (sqm) office space for rent in within an office complex located off Idejo street, which is office Adeola Odeku street in Victoria island Lagos. The good news is that this office space has already been partitioned into offices so the new tenant does not have to incur that cost. And rest rooms are included in the facility. Please note that this office space is on the first floor of a 3 storey building. 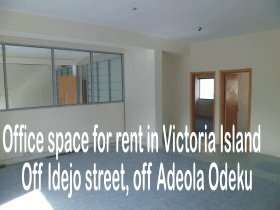 This office space for rent off Idejo street VI is vacant and there is pay and pack-in, no need to wait for an existing tenant to exit. One year service charge required in advance. 2. 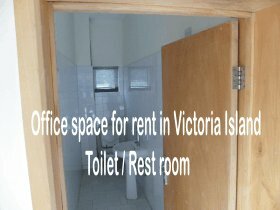 Office space for rent near Afribank street Victoria Island Lagos Nigeria. The property is an 11 storey building with each floor being 652 sqm. This office building has a basement parking lot and impressive facilities. Join in and write your own page! It's easy to do. How? Simply click here to return to Office Space For Rent.